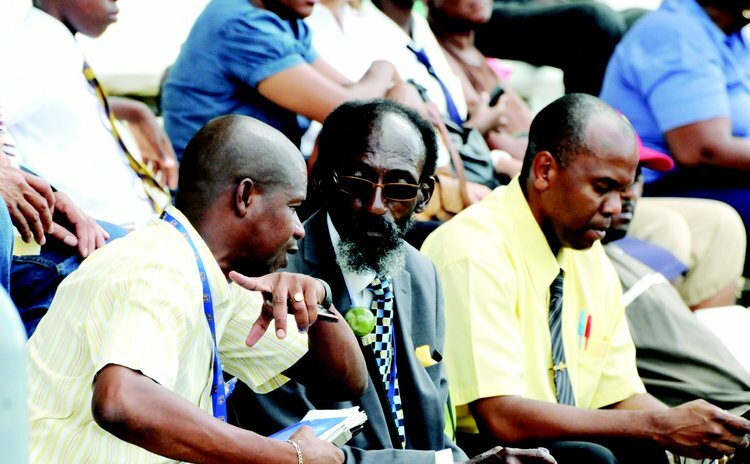 Keith F. C. Van Anderson, a bearded and pipe-smoking MCC member is one of the eccentric characters (the others are Chickie, Gravy, and His Majesty King Dyal) who have enlivened Caribbean cricket grounds over the years. The 62 year old Guyana- born English resident has followed the West Indies cricket team across the world and is now in Dominica for his second visit, attending the second and final Test between West Indies and Zimbabwe. In an exclusive interview with the SUN on Thursday Van Anderson says "there has been an improvement in West Indies Cricket over the last 12 months. We have seen wins in the Twenty20 also in Test series." He said, however, as it relates to the upcoming election to the West Indies Cricket Board: "I think it's all about people's selfish motives and not for the good or cricket or grassroots of West Indies cricket." "I cannot see what the West Indies board is trying to achieve. Whether if it's clouded or it's on the horizon, I am not so sure but I know that we all wish for the betterment of West Indies cricket. But for some reasons I am not sure why this is happening, all this antagonism from people presently on the board and from those who are trying to achieve office in the new administration," Pipe Man said. He advices the administrators that whatever funding they may manage to gain, that it should go into grassroots cricket and the improvement of West Indies cricket in the region. The idea, he said, of officials trying to gain office for personal gain should never be entertained. "The current incumbent of the presidency, it appeared, had a change of heart after he is alleged to have indicated that he was no longer interested in the top job. Now, whether that is true or not I am not sure, but something seems not at all right at all," he stated. In looking at the recent success of the West Indies team, The Pipe Man said the Windies players have not encountered any strong opposition, (Bangladesh, New Zealand and Zimbabwe) and it seems so one-sided; but the players have shown a marked improvement and he is hoping that they will get better and show continued improvement over the next 12-18 months. "I have been a heavy critic of Captain Darren Sammy, and don't think he is a Test player and commands a pick on the West Indies team," he said. "However, he has grown over the years and I will reserve my comments with him as a Test player. The records have shown that he has justified his place in the team…not sure what will happen in the next 12-18 months but for now I wish him all the best as he continues leading the West Indies team".